Spotify offer some great tools to analyse and present your artist presence on their platform, but as Darren might have mentioned once or twice; tools for artists to market themselves seem to still be severely lacking compared to other platforms like Pandora, YouTube and Deezer. 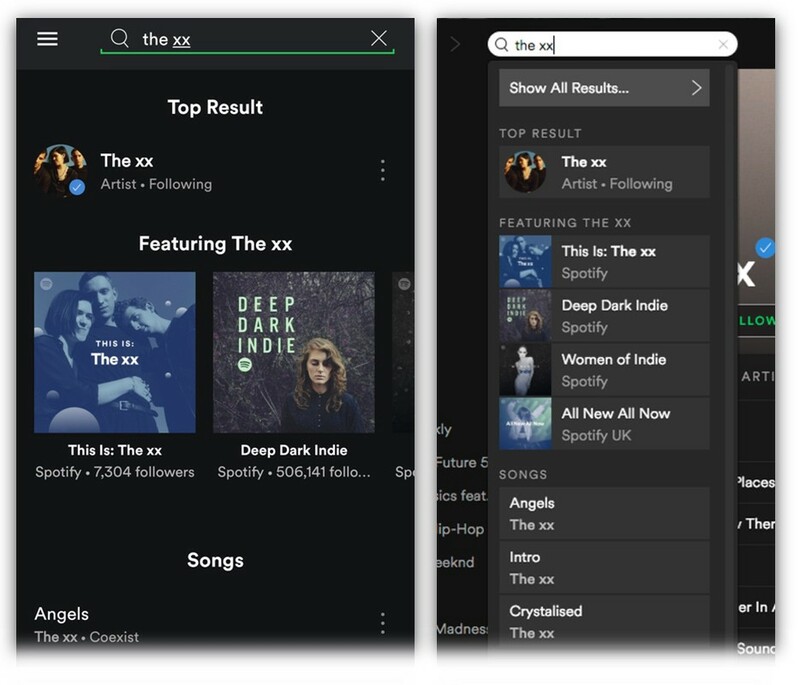 There are a couple of recent changes in Spotify’s search that are worth a closer look for artists, managers and labels. This seems like something artists should be concerned about as Spotify is essentially siphoning off organic traffic (traffic the artist is creating through various off-Spotify activities) and directing it towards their own editorial. At the point where a Spotify user is searching for my artist name, the last thing I’d want them presented with is a list of playlists that might include one of my tracks alongside 50 others. This would take them from being super-engaged (by searching for me specifically) to being extremely passive, all in a single click. The “Featuring [Artist Name]” seems like a fair feature for Spotify to include in search; it is just worrying that they have chosen to insert this above the artist’s Songs, Albums and own Playlists sections. This takes us onto the second addition to look out for: a new “This Is: [Artist Name]” Playlist has been created for many artists by the main Spotify profile, described as “An introduction to the music of…” the artist. This is another feature that may split opinion. On one hand it at least means that one of the Spotify-owned playlists in the “Featuring [Artist Name]” section contains music exclusively from the artist being searched for. On the other hand, it potentially devalues the work some artists have put in to curate their presence on the platform by bumping their own playlists way down the search results while presenting a Spotify-owned playlist at the top, despite it potentially having far less followers, like the example below. A playlist curated by the artist with ten times as many followers is relegated to near the bottom of the search results while the new “This is” Spotify-owned list is added in near the top. No doubt this will quickly replace the artist-curated list as the default introduction to the artist. Also worth noting is that album results — whilst varying in position in search results — are now much further toward the bottom, coming up in 5th to 7th (out of 7) places in artist search tests. As mentioned above and in the linked articles and podcasts, it is hard enough to market off-Spotify and drive people to the platform effectively, and there are very limited tools to market on the platform itself. If search is now compromised, so that even once you build organic awareness and activity around an artist that interest is driving traffic to Spotify editorial, rather than the artists releases or artist curated playlists, there is a problem. When it feels like there are more calls than ever for Spotify to open up its platform to third party editorial, this is a backwards step. Surely artists who take time to curate should be rewarded, and their efforts should be allowed to be presented to Spotify users who show an active interest in them ahead of Spotify’s own editorial? Equally if Spotify is now demoting full album results to the very bottom of the pile in search results, it is making a clear statement of intent around playlisting being its main priority. This would be fine if it was democratising that part of its platform — however it is not, and when George Ergatoudis is making a clear statement of intent around building playlists and then taking them beyond Spotify, something is very, very wrong here. This is not a pro-artist platform: it is Spotify’s attempt to position itself as the absolute gatekeeper between artist and fan, which is not a beneficial situation for either party. In fact there is only one beneficiary in that arrangement: Spotify itself. Considered in that context, YouTube may not be such a bad place after all. A roundup of key news in tech, music & apps. It is curated by Darren Hemmings, founder of Motive Unknown. Signup at site for FREE daily email summary!